I have mentioned several times before that I avoid posting product-only-focused material in this blog, but when we announce something new, it is appropriate for me to mention it here. Today, a press release went out about our new AC sources (click here to view). You may not realize it, but this press release marks the end of an era; these are the last power products Agilent Technologies will ever announce! Now don’t go all non-linear on me…..I’m sure we will continue to design and release new power products for decades to come. 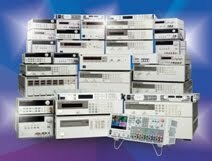 But as I mentioned in a previous post (click here), as of August 1, 2014, our products will be Keysight Technologies products and not Agilent Technologies products. So these new AC sources will be rebranded to Keysight in a few weeks, but because we are releasing them before the company name change is official, we have to release them as Agilent and not Keysight. Go figure…. For a DC output, the graph above shows only the positive voltage and current quadrant (first quadrant). 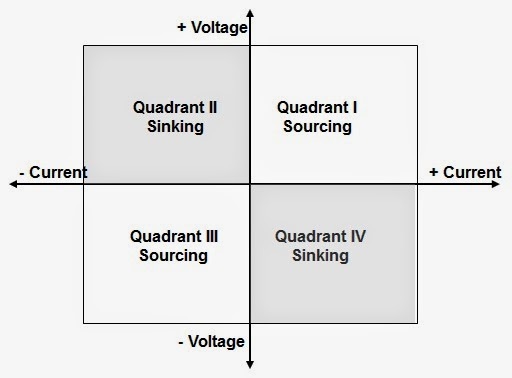 The output is equally capable of putting out negative voltage and negative current (the third quadrant) and the ratings are the same (except negative). These AC sources only source power; they cannot sink (absorb) power. These AC sources do have one advanced feature: you can set the phase angle at which the output turns on. Coupled with the ability to measure peak current (and hold the peak current measurement), this is good for AC inrush current measurements. To view the data sheet, click here. So that’s the new line of basic AC power sources from Agilent and the last power products to be announced by Agilent. I wonder when the first Keysight power product announcement will be…..wouldn’t you like to know!?!? Labels: ac power source, AC source, AC6800 series, AC6801A, AC6802A, AC6803A, AC6804A, Misc. 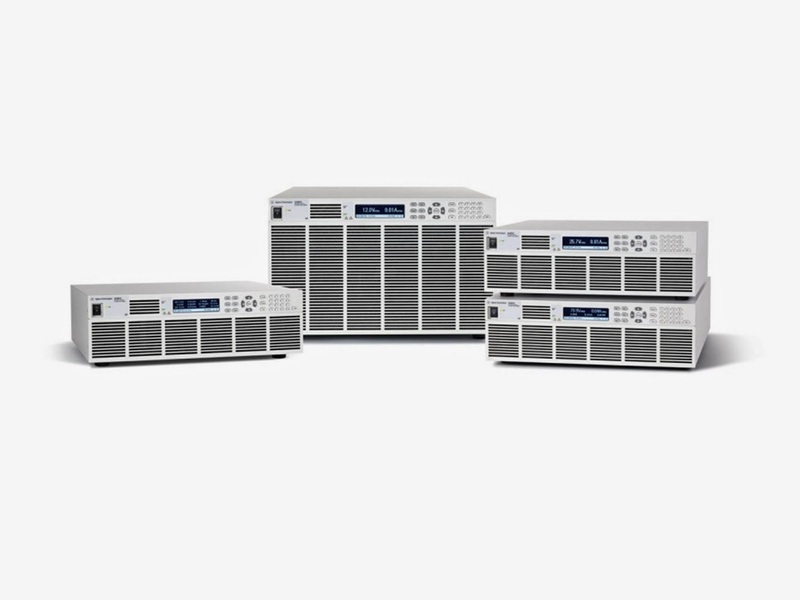 Today’s system DC power supplies incorporate quite a variety of features to protect both the device under test (DUT) as well as the power supply itself from damage due to a fault condition or setting mishap. 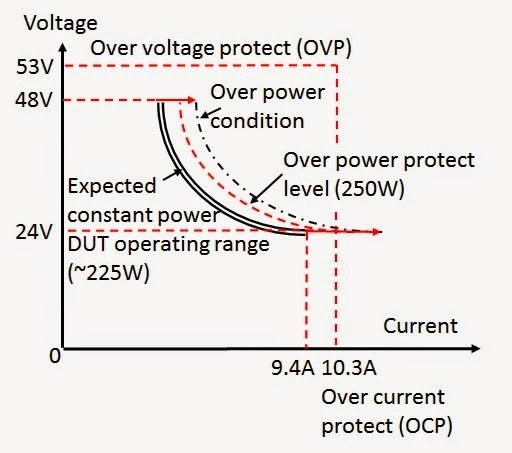 Over voltage protect (OVP) and over current protect (OCP) are two core protection features that are found on most all system DC power supplies to help protect against power-related damage. OVP helps assure the DUT is protected against power-related damage in the event voltage rises above an acceptable range of operation. 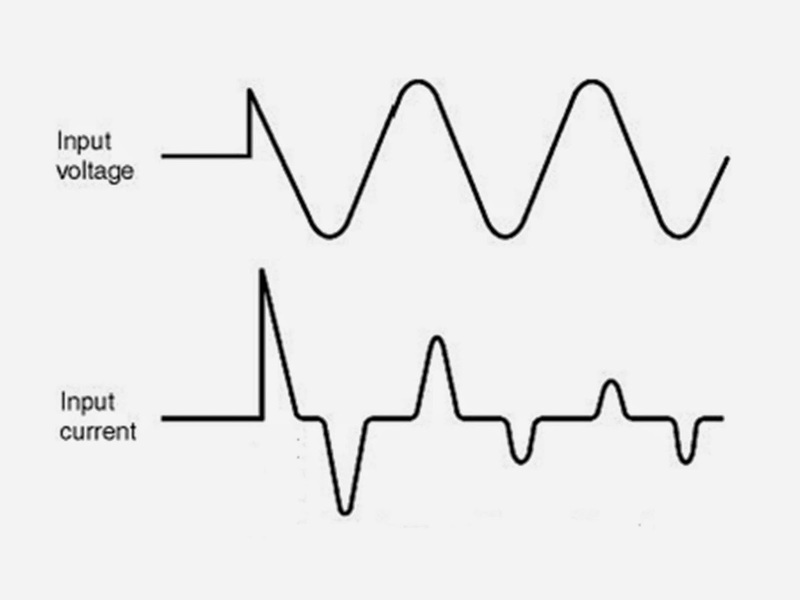 As over voltage damage is almost instantaneous the OVP level is set at reasonable margin below this level to be effective, yet is suitably higher than maximum expected DUT operating voltage so that any transient voltages do not cause false tripping. Causes of OV conditions are often external to the DUT. 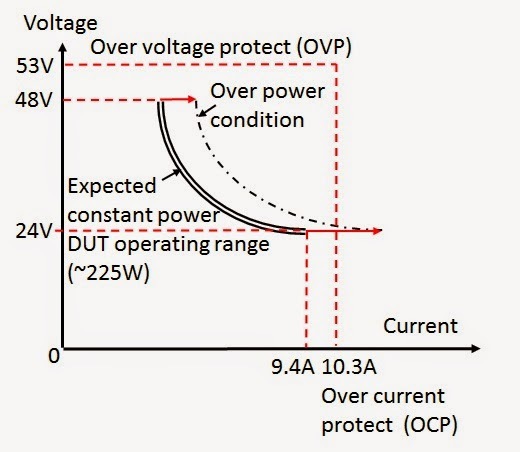 OCP helps assure the DUT is protected against power-related damage in the event it fails in some fashion causing excess current, such as an internal short or some other type of failure. The DUT can also draw excess current from consuming excess power due to overloading or internal problem causing inefficient operation and excessive internal power dissipation. 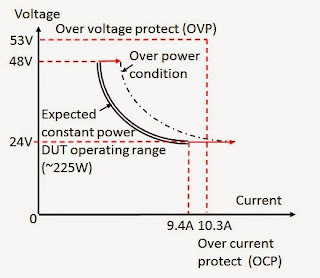 OVP and OCP are depicted in Figure 1 below for an example DUT that operates at a set voltage level of 48V, within a few percent, and uses about 450W of power. 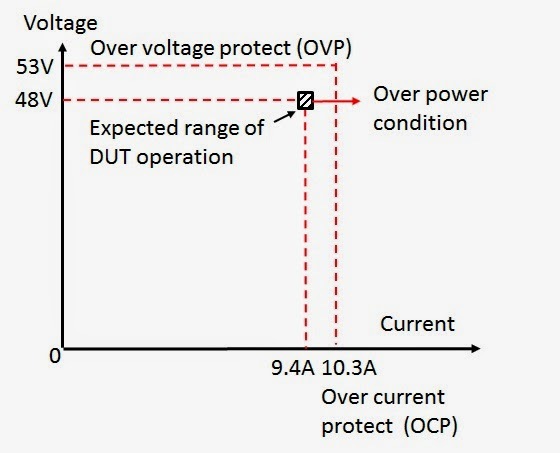 In this case the OVP and OCP levels are set at about 10% higher to safeguard the DUT. 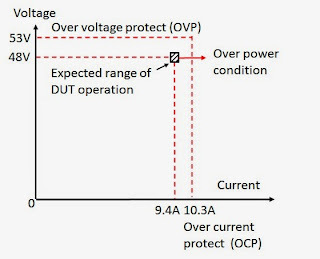 However, not all DUTs operate over as limited a range as depicted in Figure 1. Consider for example many, if not most all DC to DC converters operate over a wide range of voltage while using relatively constant power. Similarly many devices incorporate DC to DC converters to give them an extended range of input voltage operation. To illustrate with an example, consider a DC to DC converter that operates from 24 to 48 volts and runs at 225W is shown in Figure 2. DC to DC converters operate very efficiency so they dissipate a small amount of power and the rest is transferred to the load. If there is a problem with the DC to DC converter causing it to run inefficiently it could be quickly damaged due to overheating. 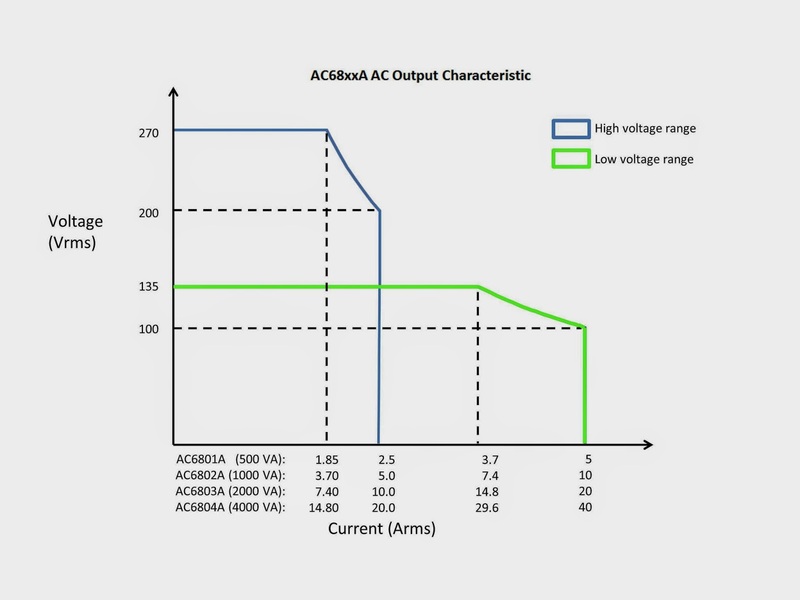 While the fixed OCP level depicted here will also adequately protect it for over power at 24 volts, as can be seen it does not work well to protect the DUT for over power at higher voltage levels. 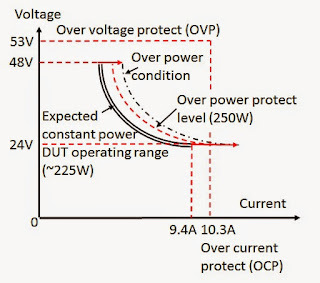 A preferable alternative would instead be to have an over power protection limit, as depicted in Figure 3. This would provide an adequate safeguard regardless of input voltage setting. 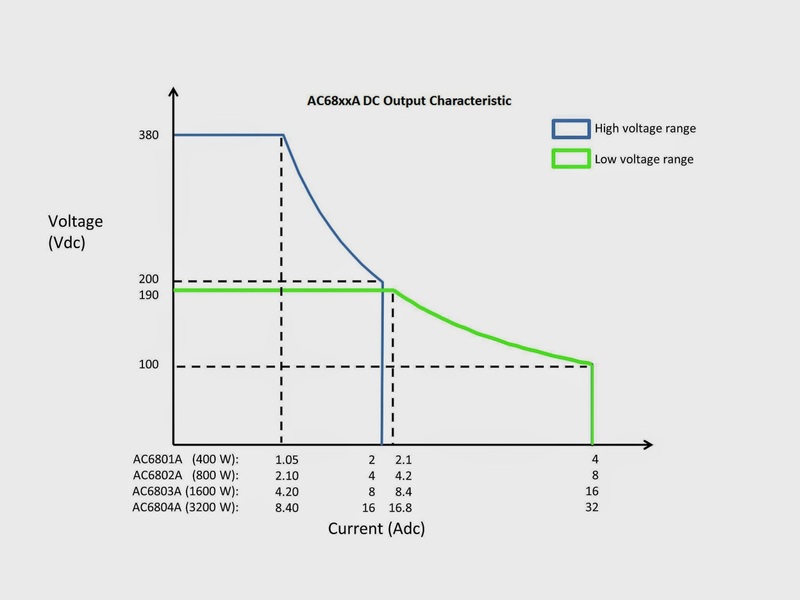 As an over power level setting is not a feature that is commonly found in system DC power supplies, this would then mean having to change the OCP level for each voltage setting change, which may not be convenient or desirable, or in some cases practical to do. However, in the Agilent N6900A and N7900A Advance Power System DC power supplies it is possible to continually sense the output power level in the configurable smart triggering system. 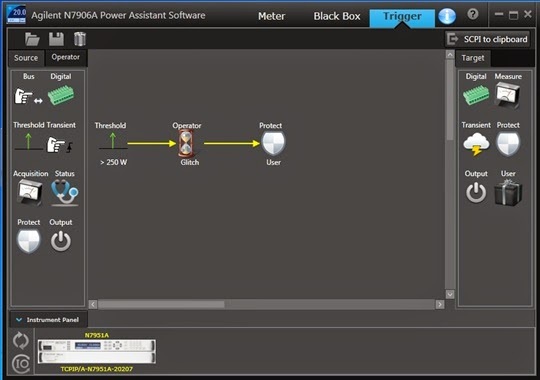 This can in turn be used to create a logical expression to use the output power level to trigger an output protect shutdown. 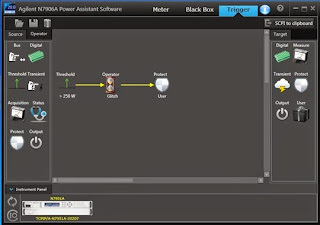 This is depicted in Figure 4, using the N7906A software utility to graphically configure this logical expression and then download it into the Advance Power System DC power supply. As the smart triggering system operates at hardware speeds within the instrument it is fast-responding, an important consideration for implementing protection mechanisms. A glitch delay was also added to prevent false triggers due to temporary peaks of power being drawn by the DUT during transient events. While the output power level is being used here to trigger a fault shutdown it could have been just as easily used to trigger a variety of other actions as well.